Often times I hear the claim that (programming language) syntax doesn't matter or if it does, it's only to provide some subjective readability aesthetics. It's somewhat surprising to me how large majority of supposedly rational people like programmers/computer scientists would throw out objectivity with such confidence. So let me provide a simple real world case where uniform syntax enables out of the box solution which is qualitatively simpler. This is practically achievable (Turing-completeness doesn't help much) and idiomatic in very few languages and about a single one of them has the additional means and synergy to pull it off with great performance. We develop tiny SQL-like query engine from scratch in Common Lisp which performs on par with a cheating C++ version and handily outruns even more cheating Go version. This is possible because CL compilers are competent, blazing quick and can be programmatically evoked at runtime over arbitrary just-in-time generated functions. 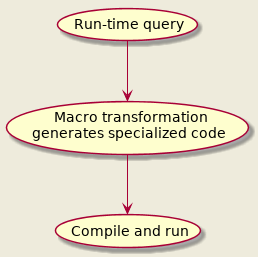 Generation and native compilation of specialized for any concrete query code is deferred right back to query (run) time. Where other languages must pre-compile recursive interpreter, CL compiles down a single if-condition. As for code generation we have the full power of the language plus whatever we've additionally defined, we show off arguably the most powerful Common Lisp Object System (CLOS) in use. This combined with the fact that generating code in Lisp is isomorphic to writing "regular" code, makes the solution so simple, concise and elegant, it's difficult to imagine it does the same thing as those unsung geniuses writing low-level optimizing compilers in all those powerless non-Lisp languages. Here's our situation: there are over 100 let's say plain text dbs, each one containing lines of different fixed-size fields ASCII format. Let's assume lines within a single db have same format. We'll have to iterate all db entries, check the WHERE filter over each line and extract information to be returned in case it passes. These queries can happen to run over billions of entries so we'll eye some "systems" language, band-aids like Python are out of question. Let's focus only on the filter condition. WHERE is essentially a tree where intermediate nodes are boolean predicates and, or or not and leaves being concrete line field operation - comparison, regular expression matching, either with constant string or other field. So how do we go about it? A straightforward way is to create a tree structure instance mirroring the WHERE clause and a matcher which would traverse it for each line to see if the clause is satisfied. If there's one problem with the above, it would probably be that match is recursive (and not in good tail-recursive way) so the compiler wouldn't be that jubilant. There probably is a way to linearize the WHERE tree but I'm a little concerned to think out in depth how to conserve the short-circuiting without backtracking and getting a headache. We assume certain pre-processing is done while building the tree, like assigning proper operation type; checking if regex filter is not really regex, in which case getting downgraded to substring search etc. For a complete solution we'd need a query parser (or may defer to something like JSON and use existing parser though that wouldn't be very ergonomic for interactive use) and another interpreter to translate and pre-process parsed tokens to the above data structure used in the hot loop. I actually didn't consider Approach I at all until much later, and that for educational purposes. It somehow seems artificial and more complex than the problem it solves. I mean, look at the SQL WHERE clause - it's a boolean expression almost inviting for immediate evaluation, why do we have to write tree traversal and not "just" use our language's built-in machinery? Can you extract me this and that field where such and such conditions are met? Like in the next hour? Thankyouverymuch! Which is about as simple and efficient (save for some clause reordering that can be done in order to push cheaper checks earlier) as one can get. No recursion, no switches, no loops. Some contrast to the general solution! Ignoring syntax noise, this is direct translation of the WHERE condition. By the way did you notice how ugly the one-off thing looks? All those parenthesis… We declared interest only in "systems" languages but let's see how we'd approach this problem from Common Lisp's side2. Don't know about you, but on my eyes this looks better than SQL's supposed to be humane syntax. A recurring theme in Lisp eDSL programming is that one first chooses nice succinct S-expression representation (leaving all parsing to the Lisp reader) and then is confident that will be able to transform it to whatever executable code is needed. We can of course implement Approach I now. But we can do better. Much better! So select has to be macro (the chosen representation doesn't adhere to the function calling convention, for user convenience) which expands to procedure that maps over the given db, compiles (CL compilers are lightening fast) and then calls it. Note that during its macro expansion, it will be observing a concrete query so it can check out the db and its schema, what fields are selected, what is the exact WHERE clause and based on these - emit appropriate specialized code. Instead of solving the problem for all possible queries as Approach I must, we can instead solve for this single case. That's our time pausing mechanism. "Generate selection procedure and run it." Here do-lines would be a macro that abstracts iteration over db entries. spec is for example structure/object instance which holds information about specific db - storage (file), entry size, field names with their offsets and sizes. I won't spell it out, you can imagine what methods working over it would do. Result wise we can get away only with the body of the procedure enclosed by do-lines but depending on lisp implementation, this might get executed in interpreter mode4. However, in this case we want to explicitly ensure compilation happens. "Bind LINE-VAR to each line in SPEC specified file and execute BODY." See, that's what it takes to provide convenient zero cost syntactic abstraction for specialized file line iteration in spirit of the built-in dolist. No need to hack the compiler, pray to BDFL and/or assemble language committee for agreement. I didn't name this do-file-lines because it can be extended to handle other db storage types, key-value, SQL, whatever. This is the place to extend if we go for parallel processing too. "Create actual boolean tree for WHERE. LINE-VAR is symbol representing the current line variable. SPEC contains fields' offset and size information." Where gen-field-op based on the field operation, fields and constants involved and given the specification for field offsets and sizes would generate appropriate code. Amusingly this miniscule recursive, let's say transpiler, corresponds to the recursive match procedure in the Approach I solution. Only the former solves the problem partly at compile-time (macro expansion time if we have to be pedantic) and eliminates run-time recursion, while the latter is confined to roar only at run-time. "Get dimensions of literal string OPERAND." "Get dimensions of field OPERAND according to SPEC." "Generate code for a leaf where CLAUSE." "Check if string is not really a regex. "Generate code for regex clause." "Return string/char operation corresponding to OP." "Generate code for a comparison clause." Beside more readable, that's analogical to the C++ one-off version. From such base, we can apply other transformations like result-preserving boolean algebra or just reordering. While the WHERE simplification is most substantial, other parts of the selection procedure can also enjoy improvement. Concretely, under Approach I one has to introduce cycle over the selected fields to print them. We can do this of course but Approach II allows such loop to be unrolled during the macro expansion phase. Why do this? "Unroll selected FIELDS' print statements. SPEC holds field offset details." We can check if adjacent in the schema fields are selected next to each other and fold them within single write-string call. We can also unroll just some fields and leave a loop for the rest if too many, not to blow executable size. We are trying to help the compiler generate good code while the compiler is helping us generate good code. Escher would approve. Congratulations, we just made a working file query engine6! We designed a nice query language, outsourced all parsing to the Lisp reader, courageously went onto implementing a one-pass to-source compiler (which in this case is easier than interpreter!) and even managed to sprinkle some optimizations. And on top of that, the language implementation borrowed us its "real" compiler (at run-time!) to optimize the expansion and generate machine code. Which is about what one would write by hand if not lazy to unroll loops…and not afraid of magic constants. And nice starting point for the compiler to generate machine code before running it over the db. In fact, in similar vein the cl-ppcre library used here goes a step further than usual compiled languages to build regex state machine scanners for constant literals (as is the case in our expansion) at compile-time thanks to a compiler macro. I hear people are still struggling to hack limited form of this with templates in C++? Skeleton is same as before, we only add a buffer dedicated to reading several lines at once and then slide through it, copying and converting bytes to the line variable. With this, performance goes around 1.5 - 2 times slower than C++. But we can do better! To go further we can try to leave aside copying and converting raw bytes and instead apply comparisons directly over them (what C++ does). So I Quicklisp-ed the ascii-strings contrib of the cl-string-match library to help with this. Unfortunately I couldn't find substitute for the regex matcher that works on byte arrays, so we'd still have to make conversion for fields which are matched against regex. ;; (write-string line nil :start 2 :end 4) ? I won't go into detailed implementation, the previous snippets should have shown how programmatically manipulating code in Lisp is indistinguishable from juggling with data. These adjustments are not really rocket science. You can see a more elaborate and complete implementation in fdbq. How does it compensate during parallelization? It may have something to do with the excellent lparallel library allowing easily wipe a scheme which better saturates the CPUs while playing well with the system caches. The second argument is a NUMBER, not a FIXNUM. The result is a (VALUES NUMBER &OPTIONAL), not a (VALUES FIXNUM &REST T). The second argument is a NUMBER, not a (SIGNED-BYTE 64). As the examples show, Common Lisp actually has unexpectedly rich type system. Combine this with metaprogramming (where Lisps excel at) and one can generate pretty trimmed static code where needed. The ability to see how a function's disassembly changes after code adjustments is also quite helpful and insightful. THE PARENTHESIS, MY EYES! Sir, just use "modern" dynamic language which provides eval. In contrast to random-syntax code-is-a-string/file-blob languages, Lisps deal with already parsed trees basically all the time. Simple and reliable to generate, traverse, transform. DSLs become so easy to implement, it feels like cheating. Nowadays there's multitude of languages that bolt on quasi-quote macros in the style of Common Lisp backquote expressions. And people are quick to assume that Lisps are now completely assimilated by more mainstream languages, yadda yadda (obviously never heard of CLOS or CL's condition system). Some of them are even statically typed, though these often have limitations on what can be done at compile time. They are normally nice enough to easily implement syntax sugar like the simple version of do-lines. But once a task gets a bit harder like having to introspect, generate non trivially structured code and/or combine transformations - implementation (if at all possible) degrades to undecipherable syntax noise that requires PhD to figure out. And the reason is that unlike Lisps, their random syntax is hardly representative of the abstract syntax trees the interpreter/compiler works with. So they invent yet another random syntax sub-language to bridge them. These ain't "acceptable Lisps". Where metaprogramming power comes from? Beside the infamous uniform structured syntax which allows duality between code and data, Lisps normally make distinction between several possibly interleaving and recurring phases of program existence and provide hooks into them. Or rather rewrite rules. And what language would you reprogram them in, some dumb pre-processor or half-assed template engine? No, it's turtles all the way! Think Lisp tricks end here? Common Lisp like Smalltalk is not just a compiler but an image environment. The image initially contains just the core language (and reader + compiler and/or interpreter) and is incrementally extended and changed during development/user interaction. Be it by loading libraries, re/defining functions, constants, re/setting global variables, executing code with side effects etc. How would one produce user facing executable? Dump the current image14. This opens opportunity to also embed data within the image before dumping which would otherwise have to be loaded, parsed, pre/processed during execution. For our little query engine such data are the configuration specifications for the multiple dbs. These rarely change and makes sense to be parsed down to particular structure instances and put into a global hash table variable for example before dump thus becoming available and ready to use immediately on image execution. This would additionally improve executable's latency for queries. One may object that all falls into place only if we "limit" users to S-expression DSLs. What if forced to literary provide SQL syntax? Common Lisp in particular has reprogrammable reader through reader macros which allows performing read-time transformation (before "regular" macro expansion time) of more funky syntax (with some limits) to good ole S-expressions. We'll have to do some parsing by ourselves, like animals, but using this would allow us keep rest of our solution unchanged. Looking at conference materials, lispers (at least the Common breed) at times take advantage of such techniques15 for difficult problems but seem troubled to gain attention of the outside world. I've been cheering for the Gentle Introduction to Compile-Time Computing series to really launch for deeper descend into the matter but even the outline can suggest what sort of magic is possible. Traditional recommendations for macro black belting are On Lisp: Advanced Techniques for Common Lisp and its logical successor Let Over Lambda. The Art of the Metaobject Protocol is the bible of object system metaprogramming. Paradigms of Artificial Intelligence Programming: Case Studies in Common Lisp is an instructive showoff how complex systems become not so complex with a powerful language and clear idea. Most of the above require CL familiarity. If one lacks such, A road to Common Lisp is an excellent getting started guide. Newcomers are generally recommended Practical Common Lisp or if more humourous: Land Of Lisp; more seasoned practitioners: Common Lisp Recipes and The Common Lisp Cookbook. For an advanced development environment, one can try Portacle or possibly Lem if not much into Emacs. One may rightfully note that such data seems plain meant for SQL storage. There are some complications in reality including size, performance needs and slight deviations from the fixed format why this is not done. Although Common Lisp (CL) is dynamically typed (also strongly typed) and everyone "knows" such languages are doomed to be slow, CL is rare exception. One reason is history. Lisps were the primordial wave of dynamic languages and had to run acceptably on quite limited hardware compared to nowadays. Thus they were crafted in ways where possibility for performance optimizations were kept in sight and with Moore's law still progressing - they were gradually catching up the statically typed languages. To the point where operating systems were written from the ground up. With Common Lisp being merger of the original line of dialects, there are many places in its specification where freeways for implementations to perform optimizations are present. The interpreter approach in a "usual" (or as they say - blub) language should also do this before the iteration begins but there's no way to specialize the code structure at that point, only the data. Some CL implementations work only as interpreters, others only as compilers. It will be all the same in such case. Talking of CL implementations, there's bunch of standard compliant ones with different pros and cons - here's slightly outdated survey on most of them. Probably the biggest omission is the recent Clasp implementation. Array bound checks should be unconditionally elided within the (safety 0) optimization level. In case we decide to go berserk… like C/C++'s only mode of operation for POD types. If one may object that C++ code in this article is somewhat less, thus perceivably simpler - remember, it presents just smaller part of a full solution. 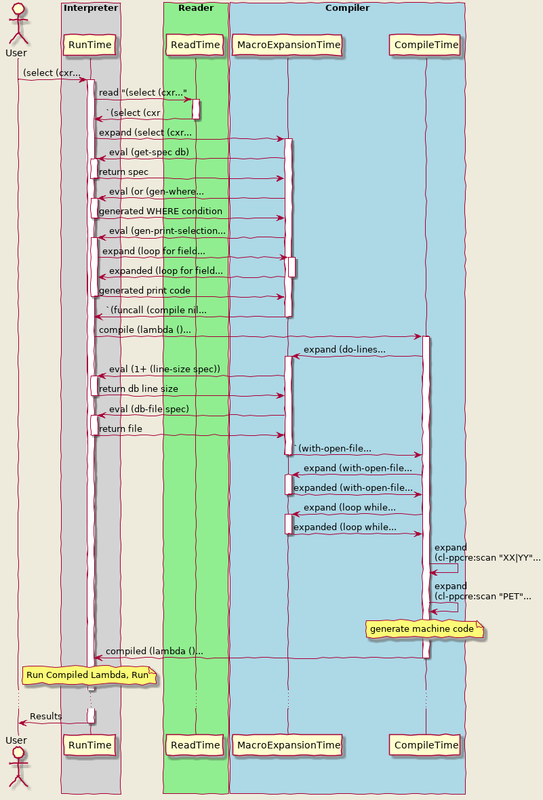 That's Approach I without actual query parsing, just a mocked up specific WHERE tree instance. So not quite a real solution either, thus times are a bit optimistic. Yeah, I'm lazy (and life's too short for so much C++ ceremony). The Clozure Common Lisp implementation is not to be confused with the Clojure language, also part of the Lisp family. For instance see the Redefining Classes machinery in the Common Lisp HyperSpec. Beside metaprogrammability and being as imperative as it gets, CL sports fantastic object system, has adequate out of the box support for functional style and lower level bit-twiddling at the same time. Generally, it can assimilate many outside paradigms as if they were native thanks to being the programmable programming language. There are library extensions for logic programming, expert systems, nondeterministic and constraint programming, pattern matching, dataflow… which normally blend with rest of the language, just like user code becomes indistinguishable from the core functionality. See The Computer Language Benchmarks Game to get rough idea. With all the usual toy micro benchmark disclaimers, Common Lisp/SBCL's competitiveness against statically typed languages is kind of embarrassing to the latter. And that's using same algorithms. Julia can almost match Common Lisp for this query engine thing. However, it seems to only be able to invoke (implicitly) the compiler at run-time for generated functions which only see argument types. This is not sufficient for our queries. Thus eval interpretation has to be used and the compiler wouldn't be able to optimize the run-time generated code. In this case Approach I being subject to "normal" AOT compilation may well fare better. In contrast, with Common Lisp we are able to explicitly summon the compiler with full optimization over arbitrary generated function. The table is from Common Lisp's perspective but Racket seems to have even more elaborate macro phase system. Part of the reason is Racket, being a Scheme descendant, has single namespace for functions and variables (Lisp-1). And all those crazy academics! Among other things, the uiop library provides portable wrapper to dump images for various implementations.